I am planning to take the summer off from work to take a cycle tour of Europe of around 3 months, likely early June to early September. I post on the NYC Fixed Forum which has a few crossover members and figured this site might be a good resource with similar folks with more experience with Europe. 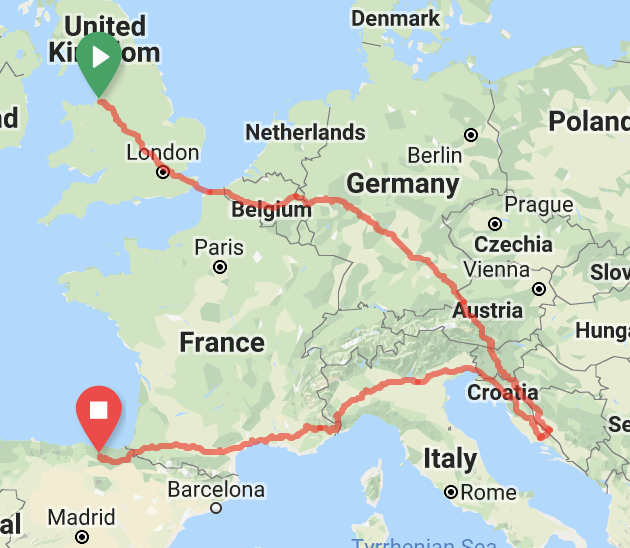 My route so far is pretty vague — I will have friends in the area of Barcelona in June, so I am thinking of starting in Portugal and doing a reverse-C across Europe and finishing at my uncle's in Thame, Oxfordshire, perhaps meeting my younger cousin at the ferry in Harwich and cycling the last bit with him. I am thinking of perhaps taking the Danube to the East, and getting myself to England via Copenhagen & Amsterdam & then to the ferry at Hook of Holland. Any advice on favorite routes to cycle through Europe? Places to avoid? Countries where it is easy & difficult to load the bicycle on a train? Places or times it'd be difficult to show up and find a hostel or place to camp? You could find Spain and Portugal pretty hot in June/July but then I'm not a great fan in the blazing sun. Alternative route would be along the Atlantic Coast but then you miss out Central Europe. Definitely ensure phone is unlocked and look into getting a local SIM card as having internet access generally makes life much easier. Most places don't officially allow wild camping but I've never had a problem with it (just don't be too blatant about it). I'm not a great fan in the blazing sun. Take pictures and report back. Three months sounds lovely. then to the ferry at Hook of Holland. Take the overnight ferry and have some beers on the boat. The ferry is wonderful! Hola there, I'm planning to cycle europe from barcelona starting june also! I already did Berlin - Lyon by hamburg Amsterdam, Bruges, Lille, DIjon... very nice but very Flat. I've made it across Europe— my final logistical issue is figuring out a shop in Edinburgh to drop my bike off for boxing between September 10 and 16 when I'll be road tripping with friends, and then how to get it to the airport for a 12PM flight when it seems like basically every shop opens at 10am Sunday, which would only get one to the airport by 1030am by cab best case— too risky, in my book. Any suggestions for a bike shop to pack my bike in Edinburgh, ideally one open 9am Sunday? https://www.crazyguyonabike.com/ is a good resource for plugging in a place name and finding good routes based on what others have written up in their journals. Do you have specific questions? Your plot looks a lot of fun. A friend and I did something similar last summer, finishing in Montenegro though (took about 7 weeks with plenty of non-cycling days). Slovenia and Bosnia were our favourites, plus spending a good couple of weeks in the alps - nothing like lugging 30kg over an alpine pass. Croatia was a bit meh, but we did stick to the coast and island hop.